I would rather walk through the woods and the grass and the briars and pick daisies and ferns and wild strawberries - or just look at the sky.... The green all about - the woods and pastures all growing wild so fast - no cows in it for three or four years - all sorts of unexpected things growing - and growing so fast - fern - little trees and big trees - flowers and all sorts of little creeping ground plants - masses of ferns that are wonderful. I love all those things so much it almost makes me feel I must stay here. Take a moment and see if you can summon up an image of Georgia O'Keeffe in your own mind. There is a good chance you see an icon: a sun-sculpted older woman whose life -- and art -- were studies in clarity and contrast. She scans the mists in the far-off mountains. She picks up a stone and smooths it, touches the twisted branch of a piñon tree, toes a patch of lichen. Two smoke-toned chows watch and sniff, then jounce knowingly after their mistress. Another day has begun for Georgia O'Keeffe. "O'Keeffe demonstrated, throughout her long life, a strong attraction to place," comments Erin B. Coe, the chief curator at the Hyde Collection, an art museum in the city of Glens Falls in Upstate New York. As those who love O'Keeffe's oeuvre certainly know, the Southwest may have been her final home, but there were many other places that she drew inspiration from including Hawaii, Texas, Maine and New York City. O'Keeffe responded to changes in setting the way Picasso responded to a new mistress: they provided fresh ideas and provoked stylistic development. 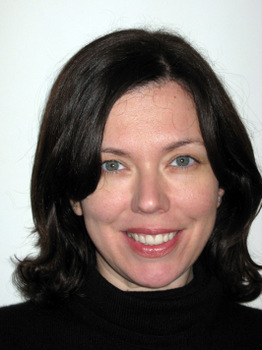 Erin Coe has been studying the importance of a place that loomed large in O'Keeffe's early development: Lake George, a 32 mile long lake at the base of the Adirondacks where the family of her husband Alfred Stieglitz owned a large summer home and 36 acres of land. O'Keeffe spent considerable time there between 1918 and 1934 -- sometimes staying the entire summer or even longer -- and eventually produced over 200 paintings based on Lake George and its surroundings, some of which she completed in her New York apartment after returning home. 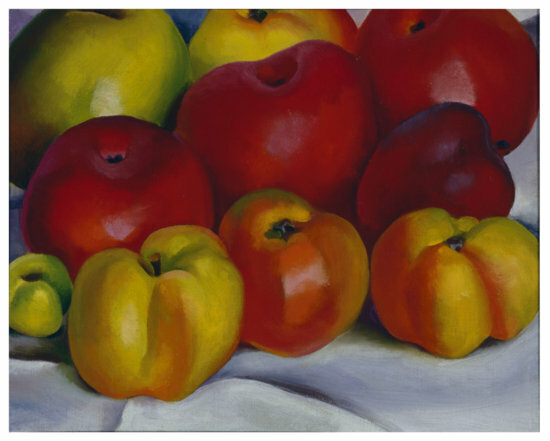 "Modern Nature," -- co-curated by Coe along with Barbara Buhler Lynes, former curator of the Georgia O'Keeffe Museum, and organized in association with the Georgia O'Keeffe Museum in Santa Fe, New Mexico -- will present a cross-section of approximately 58 paintings. 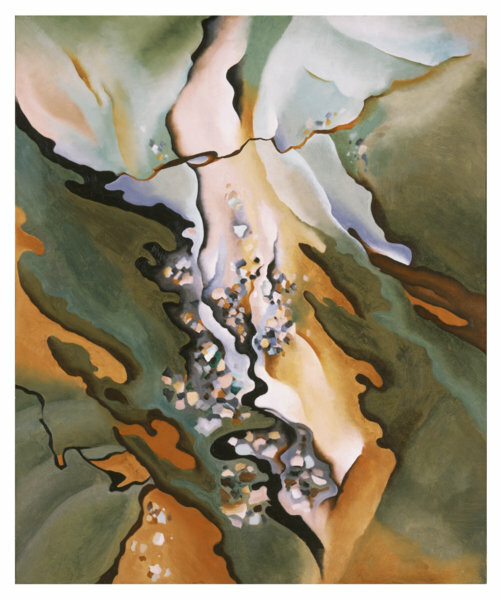 It is the first survey exhibition to focus on the formative influence of Lake George on O'Keeffe's life and art. 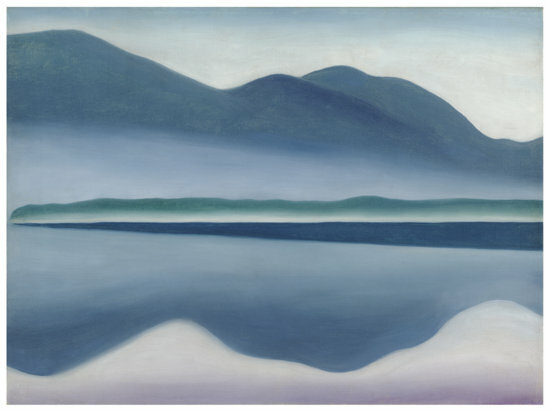 Lake George, Coe believes, was "essential" to O'Keeffe's development and to her modern vision of the natural world. The artist's 1922 oil "Lake George," -- a serene canvas featuring careful gradations of tone -- feels like a stylistic prototype of the august spareness that also characterizes her later desert paintings. By focusing on primary documents -- letters and paintings -- Coe has tried to be objective about just what Lake George meant to the artist. Because contemporary commentators have often suggested that O'Keeffe couldn't tolerate the presence of Stieglitz family members and that she wanted to "escape" Lake George, the artist's correspondence of the period has proved revelatory. In a letter written to her husband's niece, Elizabeth Stieglitz Davidson, after her first summer at the lake, O'Keeffe exclaimed "I have never been happier in my life." It was, after all, the place where she and her new husband would run upstairs after lunch to make love, and row across the lake to watch the dusk after dinner. Coe has been interested to find that the lake and its environs were often described in the artist's letters as being "perfect:"
Of all the adjectives that Georgia O'Keeffe used to describe Lake George in correspondence from the 1920s, the word "perfect" appears over and over again. There were "perfect days of perfect quiet sunshine," with "perfect" mountain views, "perfect" rainbows, and "perfect days" for working. If O'Keeffe did find herself annoyed with some of the Stieglitz family members -- and who wouldn't chafe at the idea of eating corn with twenty in-laws in around a formal dining table -- O'Keeffe also developed close friendships. Erin Coe notes that Georgia was especially close to Elizabeth Stieglitz Davidson, who she visited in both Lake George and New York. O'Keeffe, who rarely painted or drew portraits, has been said to have "painted the people without the people," and the congregation of apples she painted in 1920 may hint at the shared characteristics -- and variety -- of Stieglitz's family members. "Modern Nature" is divided into six themes: Landscapes, Barns and Buildings, Abstractions, Tree Portraits, From the Garden, and Lake George Souvenirs. The painting "Autumn Leaves," from 1924, falls into the "souvenir" category. 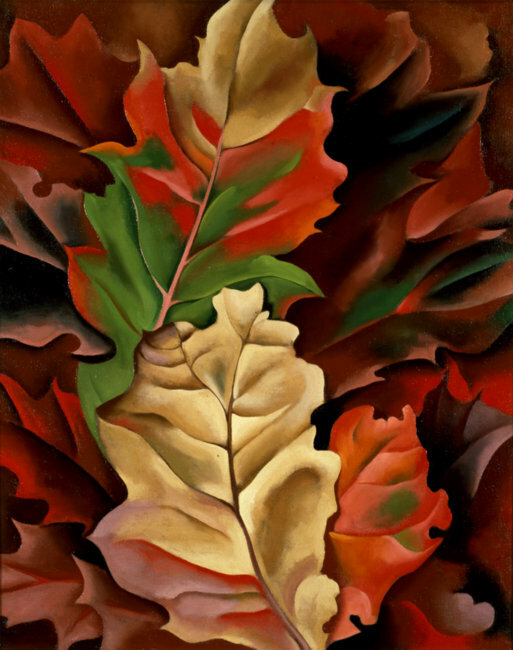 Between 1922 and 1931 O'Keeffe explored the theme of leaves on 29 different canvases, treating them with great sensitivity. In a 1930 letter she tells Alfred Stieglitz how she had "picked wonderful spring branches of leaves" which she describes as being "like rare flowers." 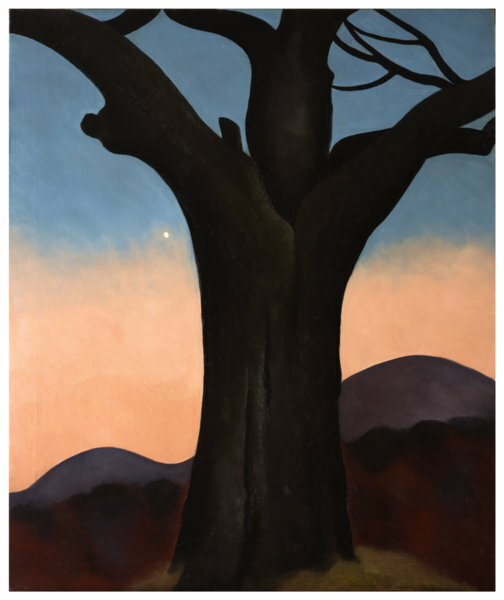 "The Chesnut Grey," a yard tall oil on canvas from 1924, is one of a pair: she painted the same tree twice, once at sunrise and once at sunset. Alfred Stieglitz had started photographing the same dying tree in 1920, and continued to photograph if for a decade. "If only people were trees..." O'Keeffe told an interviewer in 1927, "I might like them better." In the same year that she painted "The Chestnut Grey," O'Keeffe was also experimenting with abstraction in a series called "From the Lake." The third canvas in this series suggests not only a kind of overview of Lake George, but also some of the essential forms and forces of nature that O'Keeffe associated with the lake and its environs. 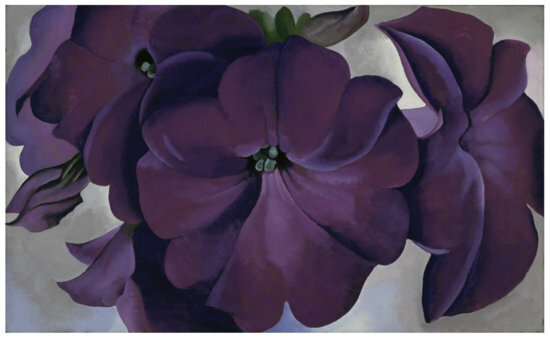 An avid gardener, O'Keeffe first planted beds of purple and blue petunias at Lake George in 1924. They make an appearance in her stunning oil on board "Petunias" of 1925, a harbinger of the many O'Keeffe flowers that would appear in ensuing years. Erin Coe, who feels that O'Keeffe has been subject of too many psycho-biographies, respects the artist's straight-forward explanation for her interest in flowers: "...everyone has many associations with a flower--the idea of flowers. So I said to myself -- I'll paint what I see..."
"This exhibition," Erin Coe explains, "is based on a simple premise: person and place were closely connected to each other." The 58 works assembled at the Hyde Collection offer an unprecedented opportunity to understand Georgia O'Keeffe's connection to a place she once found "perfect" as she worked to refine herself and her art.